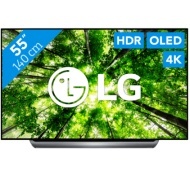 alaTest has collected and analyzed 405 reviews of LG OLED55C8 Series. The average rating for this product is 4.8/5, compared to an average rating of 4.3/5 for other products in the same category for all reviews. Reviewers are impressed by the remote control and price. The sound and usability are also appreciated, but many are less positive about the reliability. Superb picture clarity, particularly in HD programs, coupled with realistic colour which is what we like best.